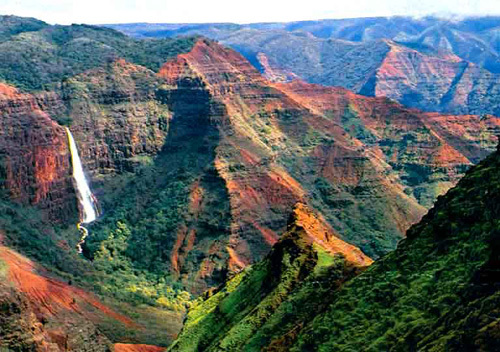 The drive up Waimea Canyon is fantastic, and there are numerous wheelchair accessible lookouts. The first lookout, Waimea Canyon Lookout, has a ramped path to a lower lookout. There’s a higher spot that is accessible via a very steep path – if you take that one, you should plan to have help coming down to avoid taking out pedestrians. Parking can be very tight, with only one or two permit spots per lookout. The Koke’e museum and the Koke’e Lodge are also accessible. The service at the Lodge is grudging, but the food is surprisingly good. There are many trailheads along the road, but we did not see any that seemed to be accessible. Edited to add: I forgot to mention that before driving up Waimea Canyon, we stopped at the Russian Fort. Following the advice in the Ultimate Kauai guidebook, we continued down a dirt road to the edge of the estuary, where the fresh water of the Waimea River meets the salt ocean. It was nice and level and open and packed down, so I wandered around quite a bit, not noticing the many small sticks with big thorns until my daughter started jumping up and down to avoid them. When we returned to the car, we pulled many thorns out of the wheelchair tires; one rewarded us with the depressing whoosh of escaping air. By the time we got to the first canyon lookout, the tire was utterly flat; by the time we got to the Koke’e Museum, the tire was rolling off the rim, and the axle housing nut had loosened, so the axle could slide freely back to front – so that was the end of wheelchairing for the day. Moral: carry the darn patch kit and tire levers rather than leaving them in the condo. Following your holiday journal with interest … and a little envy. Wish I was there! You and yours certainly deserve the break. May 2008 be peaceful and kind to you.